The Constellation Program mission requires two spacesuit system configurations to meet the requirements of Orion missions to the space station and to the moon. Configuration One will support dynamic events such as launch and landing operations; contingency intravehicular activity (IVA) during critical mission events; off-nominal events such as loss of pressurization of the Orion crew compartment; and microgravity EVAs for contingency operations. Americans may have to wrap their heads around a new spacesuit for futuremoonwalkers in 2020. 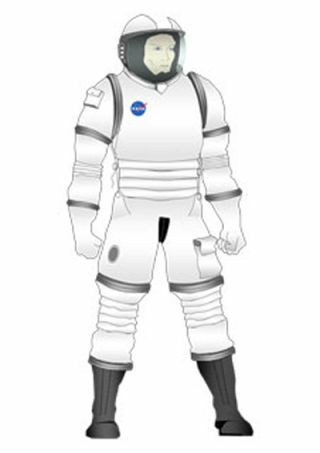 NASA?s new spacesuit will come in two versions that protect future astronautson the surface of the moon, as well as during travel to and from theInternational Space Station. The initial $183.8 million spacesuit contract to design, develop, andtest the new spacesuit through September 2014 was awarded to Oceaneering InternationalInc. of Houston, Texas, the agency announced Thursday. ?We?re ready to put them to work and put boot prints back on the moon,?said Glenn Lutz, project manager for the Constellation Spacesuit System atNASA?s Johnson Space Center in Houston in a teleconference. One version of the Constellation spacesuit will outfit as many as sixastronauts traveling up to the space station in the Orion spacecraft,the capsule-based successor to NASA?s three space shuttles after their planned2010 retirement. Astronauts can then reconfigure parts of their suit around a secondversion?s torso, which is specifically designed for providing more mobility onthe moon, before climbing into an Altair landerto head to the lunar surface. The overall suit design is aimed at protectingagainst abrasive lunar dust, not to mention micrometeorites for emergencyspacewalk activities. Apollo astronauts had to hop around on the moon due to their stiff oldersuits, but the Constellation spacesuit will give future astronauts a new stepas they roam about the lunar surface during missions lasting up to six months,NASA engineers said. ?Our design approach is to make it like walking across the desert floorto look at your favorite rock,? Lutz said. He added that the new suits wouldallow astronauts to walk more normally and focus on performing lunar geologyand other work, although he commended Apollo astronauts for ?figuring out howto ambulate across the surface? in their older, bulkier suits. Different Constellation spacesuit sizes will allow almost any astronaut,short or tall, to fit inside. The current spacesuit used for spacewalks, theExtravehicular Mobility Unit (EMU), comes in relatively few sizes and cannotfit all astronauts. However, the EMU will remain the workhorse for spacestation astronauts even after the new Constellation spacesuit comes online -final shuttle flights will storeextra EMUs on the space station before the space shuttle?s retirement. The suit requirements aim for a lifespan of six to eight years for suitsworn up to the space station, after which they will be used as training suits.The current plan for the lunar surface suits involves leaving or storing theheavy backpacks on the surface of the moon after each mission. As makers of the new suits, Oceaneering International will also likelyget two additional contract options worth $302.1 million and $260 million fordesigning the lunar suit version and producing the spacesuits through 2018. "Our team is excited about this tremendous opportunity to assistNASA in pushing the boundaries of space exploration," said Mark Gittleman,Vice President and General Manager of Oceaneering Space Systems, in anannouncement. Both old and new spacesuits tackle similar problems of protectingastronauts in harsh and unforgiving environments, despite expected improvementsfor the new Constellation suits. That means future spacesuits may just begetting a facelift instead of a complete makeover in look. ?The Apollo suit had a very endearing quality to me when I was growingup,? Lutz said, adding that the new Constellation spacesuit would not lookdrastically different but ?it won?t be my father?s spacesuit. ?